StageBuzz.com: FRIGID Festival Interview - D'yan Forest of "I Married a Nun"
FRIGID Festival Interview - D'yan Forest of "I Married a Nun"
D’yan Forest (actor/writer/producer), 77 years young, has been lighting up audiences for over seven decades. She started early with piano, then ukulele, moved onto trumpets, drums, and the glockenspiel. Her music took her on global performances in Paris, Israel and Greece. After returning to the states, this native Boston girl moved to New York City, and has made a successful career singing in 9 languages in the tri-state area: Waldorf, Plaza, and Park Lane among others. In addition to national commercials and international print campaigns, her credits include “Gigi,” “Grandma Sylvia’s Funeral,” and Shaw’s, “The Music Cure.” Her principal role as the mother in “Soldier’s Heart,” has been screened in numerous film festivals throughout the world. She’s branched into a new career as a ukulele playing comedian appearing at the Gotham, Comix, Carolines Comedy Club, the Duplex, and the Metropolitan Room. 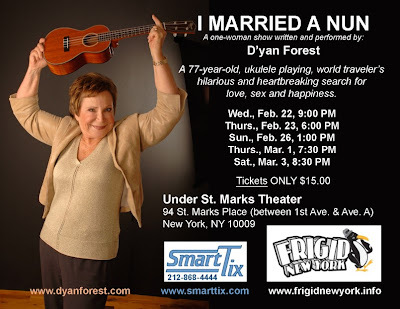 In 2011, D’yan did a solo production of her new one-woman show “I Married A Nun” at the Emerging Artists Theatre Festival and at the Dixon Place Theatre in New York City, and now brings the show to the FRIGID Festival. Show: "I Married a Nun"
At 13, I was performing pantomime and monologues for Men and Women's Clubs. At Middlebury College I majored in Drama and then spent the next 40 years performing as a French Chanteuse, doing commercials, films, and Off-Broadway productions. Currently I am a comedienne, performing at all of the clubs around town. "I Married a Nun" is a one-woman show that dramatically depicts my search for love and meaning in life, finding the answers - at age 77 - in the smoldering cabarets and demimonde of Paris. With humor, art and my ukulele, I reveal the truth that's valid for ALL of us. I've been auditioning my entire life for other people's work. If I don't get the role it's because I'm too tall, too short, too thin, too fat, too old, too young, etc. In this show I can be myself and act out funny and tragic stories from my years of living which I'm finding is the most satisfying "role" of my life! Stephen Jobes, my co-writer and director, has been my mentor for 15 years. His inspiration and knowledge has kept me going through thick and thin. After I finish FRIGID I am immediately in a festival in Phoenix, AZ, in March. In May, I'm in an Orlando Fringe Festival and in July I'll be joining the Capital Fringe Festival in Washington, DC. Of course, I'm still doing my comedy all over the place. I would love people to find an understanding of this simple phrase: L'amour n'a pas d'age (Love has no age) and no boundaries. No matter how old or young you are, you can always enjoy new adventures.